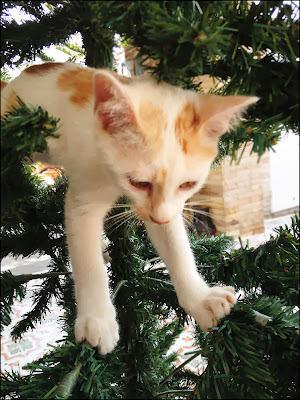 UPDATE December 30th - too busy to think about blogging. But the weather report for the last 2 weeks is simple : Blue Skies. Have not seen any rain, a bit hazy some days, breeze blowing from the northeast making water a bit choppy some days out at sea. Just about perfect weather! Happy New Year! At this time of year, I am busy working. I am shop manager at Sunrise Divers based at Karon Beach in Phuket, and high season means working about 60 hours a week. I came to Phuket in 1999 to dive, and I've made about 1000 dives in this area, but these days it's all office work, emails and websites! I am happy to say we are busy, high season has well and truly kicked in and the weather has been mostly great in the last 2 weeks. If you want to dive, do come and say hello to me at Sunrise Divers! So, the last Phuket weather blog update was December 4th. The weather was already good, mostly sunny, some hazy and grey days. Not much rain. In the last 12 days.... there has been a little rain, but nothing serious. Weather mostly hot and sunny. Winds dying down. Pretty much perfect weather. And yet online forecasts tend to show rain and thunderstorms! B*llsh*t! Example, the BBC weather forecast for Phuket shows the next 4 days with lightning or rain symbols, with a black cloud and a bit of sun peeping out. Let's see what really happens! I bet it's going to be mostly sunny, and hot! For (almost) daily Phuket weather updates, I do mention the weather quite often on Twitter - please do follow me @jamiemonk. And if you want to know what the weather is like now in Phuket, check the links on the left of the page for live webcams at Karon beach, Surin beach, Patong beach and Phuket aquarium. Note - it is high season, you can almost take it as read that the weather is good, and sometimes I am busy working and tend to forget things like Tweets and blogging. Last update on The Phuket Blog was 2 weeks ago when we visited the Siam Niramit Show. Struggling to find time for new activities right now, with work and the kids are busy with school, extra classes, music class, and on my single day off per week, a rest at home is nice! So, a summary of the last 12 days with the help of Twitter, Instagram and some iPhone photos. 5th December "Phuket weather this morning : grey with some light rain in the air." 6th December "A mostly grey day in Phuket with some light rain, and obviously some heavier rain near our house as the roads were very wet when I got home." 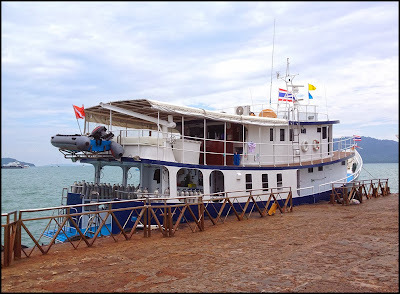 (above) The Giamani liveaboard dive boat at Chalong pier. December 7th "it's a sunny Saturday in Phuket :)"
(above) A refreshing drink at the Kopitiam by Wilai restaurant on Thalang Road in old Phuket Town. We had a little walk in the town on Saturday evening. December 8th "Perfect weather today"
December 9th .. (below) an early morning photo taken while waiting to do a u-turn. We dropped the kids at school that morning and my wife and I went for a long walk at the Bang Wad Reservoir. December 10th was another sunny day. And too busy to be taking photos. In fact I sold my camera this week, though I still have a couple of lenses ready for the next camera! Right now I am lacking time and motivation to get out and take photos except the occasional snap with a phone. The last serious photos I took were in October during the 2013 Phuket vegetarian festival. 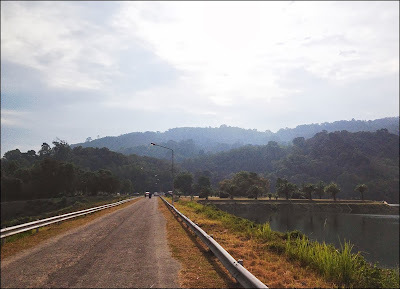 December 11th ... more early morning exercise at the reservoir, hard to believe this is Phuket! December 12th, nearly did not Tweet the weather ... "Not mentioned the weather yet today. It's partly cloudy, partly sunny, hot. Expect that to continue for the next 4 months"
December 13th "Hot and sunny day after a hazy start"
December 14th "a sunny Saturday afternoon in Phuket." December 15th "Phuket weather today, hot and sunny. Check the live webcam at Karon beach if you don't believe me :)" - A Tweet for people who maybe believe the forecast and not the real weather! And today (December 16th) has been mostly hot and sunny too. Someone Tweeted me from Bang Tao beach about 30km north of Karon Beach, and said the had some heavy rain. Not at Karon beach! And this evening the sky is quite clear, no wind, cooler temperatures (I mean about 25 C). The weather will continue to be nice. For the next few months. Mostly nice. Rain does happen, but if you are planning a Phuket trip in the next 4 months, the weather is not something to worry about!